While Facebook and Twitter is the core of the Internet’s social networking world, some companies and organizations may have reasons to set up their own social networking applications. For some companies, setting up their own social network is a good option because the public Internet may not be secure enough for certain conversations concerning sensitive proprietary information or customer contact information. Deploying your own uniquely branded social media tool with open source software could be a good choice especially if you plan to differentiate your product through custom development built on top of the open source tools. There are many open source social networking toolsets available and it can sometimes become quite overwhelming and cumbersome even to find out which one best suits your organization's requirements. Here's a list of 5 good open source social networking software which we think are the very best among the lot. Dolphin: Built on the PHP platform, Dolphin is a fully scalable and customizable social media application. 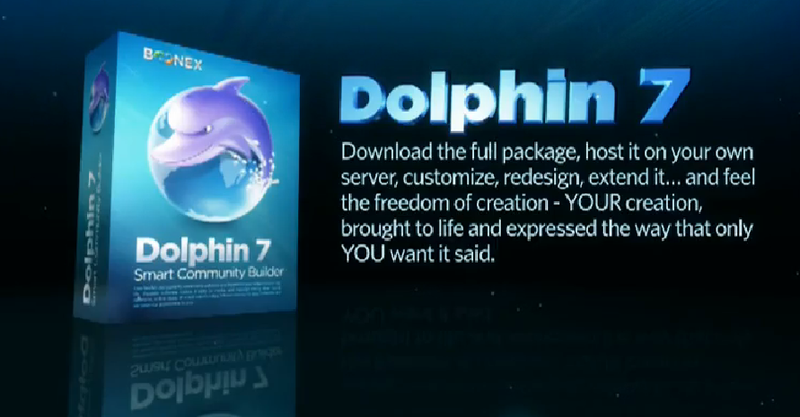 Dolphin is perhaps the most popular open source commercial social media application in the market today. Dolphin’s success is due to its development company’s long experience with creating social media applications. BoonEx has been around for more than ten years and began creating online dating software. Today, their flagship social media software, Dolphin, offers an entire suite of social networking tools that offer similar functionality as sites such as Facebook, LinkedIn, Twitter and Match. Elgg: Elgg was voted by Infoworld as the best social network platform in 2008. Elgg is especially popular in the education space as it is used by several colleges and universities, as well as high schools, as a campus wide social networking platform. Elgg boasts of an extensive plugins gallery and has a robust API set. Elgg also has a robust data model that is flexible enough to accommodate whatever your specific social media needs may be. Buddy Press: Buddy Press was built based on the WordPress MU project in 2008 and 2009. With the PHP base of WordPress, Buddy Press has grown from a simple Wordpress mod to a full blown stand alone social media application. Buddy Press can be used as a campus wide social media platform or a niche media tool for your new product or service. It can also be used as your company’s internal communication tool. The unique aspect of Buddy Press is that it can be used as an all inclusive social media platform or it can be used as an extension to your current social media tools. By using the administrative console, you can disable and enable as many features as you need in order to integrate it into your current social media platform or through a public platform such as LinkedIn. Anahita: Anahita is an open source social media development framework that is the most customizable and flexible of all of the development environments reviewed here. As a framework, it requires some technical expertise to get it off the ground, but it provides the most reliable and advanced feature set for developers to use. The privacy model is very extensive and utilizes a social networking graph structure for management. Data storage is leveraged through the use of the Amazon E3 framework. About the author: This post is written by Jason Phillips. He is a freelance writer and often writes for rounds webcam chat. Apart from that, he is a social activist and is involved in many local social activities.